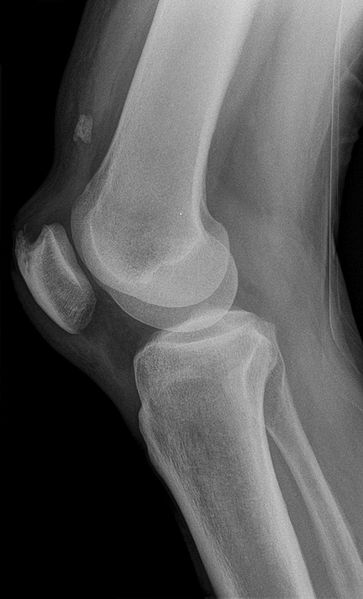 Quadricep Strain usually occur during sprinting, jumping or kicking. Strains are seen in all the quadriceps muscles but are most common in rectus femoris, which is more vulnerable to strain as it passes over two joints: the hip and the knee. 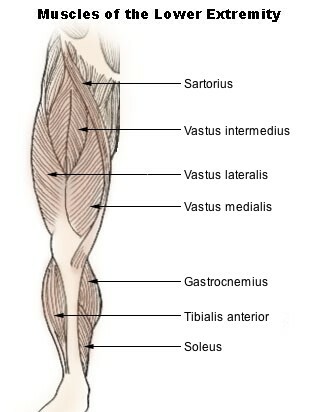 The most common site of strain is the distal musculotendinous junction of the rectus femoris. Like all muscles strains, quadriceps strain may be graded into mild (grade 1), moderate (grade 2) or severe, complete tears ( grade 3). The athlete feels the injury as a sudden pain in the anterior thigh during an activity requiring explosive muscle contraction. There is local muscle pain and tenderness and, if the strain is severe, swelling and bruising. What are the causes of Quadricep Strain? A Quadricep Strain, including ruptures, partial ruptures or strains are usually caused by a sudden twist, over-stretch or an over contraction of the muscle, such as while playing football or sprinting. Grade 1- strain is a minor injury with pain on resisted active contraction and on passive stretching. Patient feels tightness in the thigh. Unable to walk properly. Probably not much swelling. An area of local spasm is palpable at the site of pain. An athlete with such a strain may not cease activity at the time of the pain but will usually notice injury after cool down or the following day. Trying to straighten the knee against resistance probably won't produce much pain (unlike a grade 2 or 3). Healing time-2 to 10 days. Grade 2- strain cause significant pain on passive stretching as well as on unopposed active contraction. Probably cannot walk properly. The athlete may notice swelling. There is usually a moderate area of inflammation surrounding a tender palpable lesion. Straightening the knee against resistance causes pain. The athlete with a grade 2 strain is generally unable to continue the activity. Healing time-10 days to 6 weeks. Grade 3- strain of the rectus femoris occurs with sudden onset of pain and disability during intense activity. A muscle fibre defect is usually palpable when the muscle is contracted. Unable to walk properly without the aid of crutches. Bad swelling appearing immediately. A static contraction will be painful and might produce a bulge in the muscle. In the long term, they resolve with conservative management, often with surprisingly little disability. Healing time-6 to 10 weeks. Crutchs in a touch-down or partial weight bearing (painless) fashion. Hold all lower extremity athletic participation. Avoid SLR in early rehabilitation because of increased stress on torn rectus femoris. Electrical stimulation, Laser if superficial and pulsed ultrasound. Regain normal knee and hip motion. Usually intermediate stage begins 3-10 days postinjury, depending on severity of injury. Initiate a gentle quadriceps and hamstring stretching program. Aquatic rehabilitation program in deep water with floatation belt. Begin higher dosage ultrasound (for thermal effects) and or electrical stimulation, when swelling has been controlled. Increase aquatic program (deep water running). Begin knee extension with light weights. Myofascial tension in knee flexion. SLR, quads sets progressing to PRE (progressive resistance exercises) with 1-5 pound weight on the ankle. Increase low impact exercises to progress endurance and strength. Progress bicycle resistance and intensity of workout. Thera-bands for hip flexion, extension, abduction, adduction. Walking progression on jogging (painless). Initiate sports specific drills and agility training. Isokinetic equipment (at higher speeds) with patient supine. Note: Even quadriceps tears with palpable defects typically respond to this conservative regimen. Persistant defects are common, but rarely, if ever, require surgery or cause loss of function. Employ preactivity quad stretching program and appropriate warm-up regimen with return to sports. Asymptomatic with functional drills at full effort. Quadricep strength 85-90% (via isokinetic testing) of contralateral quadricep. Always warm up and cool down and stretch thoroughly before and after taking part in any physical or sporting activity in order to reduce the risk of injury. Make sure you spend time strengthening the groin and thigh muscles to improve your performance and reduce the risk of injury. Try to keep your body weight within normal limits for your height, as excessive body weight can aggravate hip pain caused by conditions like arthritis.